Big national food brands know: Marketing is everything. And they make it look easy. “Big Food” has the budget to hire top CPG and Food & Beverage branding agencies. They purchase consumer trends reports. They hold focus groups and conduct brand research to hone their messaging and visual branding. Big Food knows appearances mean everything. A walk down any supermarket aisle and you can see the evidence. Tight, slick, flashy, uniform labels screaming all the best-in-practice packaging protocols. That can be intimidating to a small, mid-sized or regional food brand with limited resources and a 2-steps-above-homemade label. Big food is listening to the research. Research (and their profit level) is telling them they are losing market share. Let’s look at that again: 4x the annual growth rate! Before we tell you how Big Food is using that research you should know that this information is available to any size food company. You just need to keep Deloitte and Food Marketing Institute on your radar. In our late spring ’17 buyer questionnaire, we asked buyers to rank the trends—consumer, retail or corporate—that were affecting their categories. 90% ranked Organic and/or Natural foods as top considerations followed by closely by locally-sourced products. All three trends are top in consumer minds and come together under the consumer’s desire for greater transparency according to the FMI /Hartman Group report: U.S Grocery Shopper Trends 2017 released in June. National Food Brands Appear Local + Natural. If you can’t beat ’em, join ’em! Those “2-steps-above-homemade labels” we were talking about earlier? They also act as visual shorthand for not only local, but small batch, natural, organic and clean-label to the average consumer. National food brands appear local by flexing their considerable marketing muscles. They revise their labels to simplify color pallets and use bold, rustic fonts. They are simulating craft butcher’s paper as label backing. National brands are even naming products using keywords like “Farmer’s Market” in a awesome display of consumer trend awareness to give the appearance of a local brand. 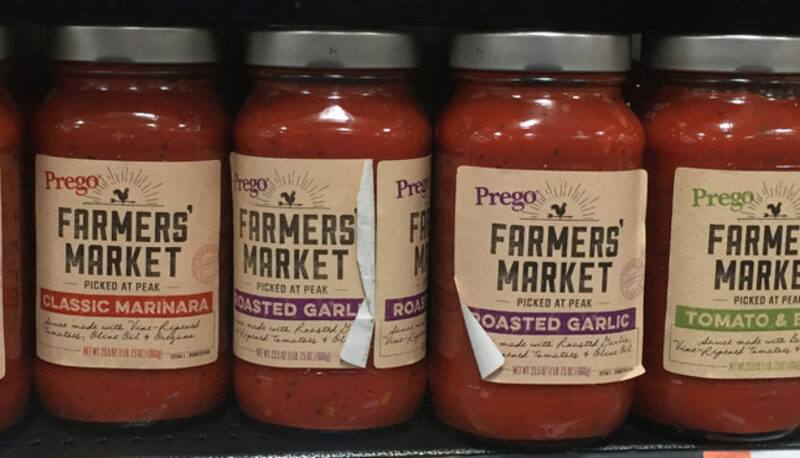 See the little 1-color “PREGO” logo hidden in the upper left on this rustic, local appearing 2-color label? This is a trend that will continue to gain traction. Meanwhile, are small food manufacturing companies nimble enough to capitalize on (or even drive) local sourcing trends? At NewPoint, we want to see smaller, local food manufacturers fight back and grow market share against these national food brands that are trying to appear local and natural. When big food promises supermarkets that they can appear local enough to placate a local-conscious consumer, they are simply using marketing to look smaller—don’t let them take your rightful place on the store shelf.